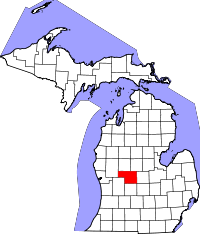 Montcalm County, named after Louis-Joseph de Montcalm, the commander of the French forces in North America during the French and Indian War, is situated close to the center of the southern half of Michigan. Those interested in researching vital records for the area are directed to the County Clerk, located in the county seat of Stanton. The genealogy research area is very limited, and only one genealogist is permitted at a time. In the event of overcrowding, individuals are encouraged to visit the City of Stanton White Pine Library, located near the courthouse, where they can view vital records indexes, as well. All records the county has on file begin in 1867 to the present, except for marriage records which begin in 1837. All are open to viewing by the public except for birth certificates dated more recently than 110 years. The office allows researchers Tuesdays through Thursdays from 8:30AM until 11:30AM, and then from 1:00PM until 4:30PM.